Killer Characters: Welcome to Inversgail! "Welcome to Inversgail—story capital of the Scottish Highlands! When you arrive, lift your hat to our statue of Scotland’s most famous storyteller—Robert Louis Stevenson. "Why not start your visit with a story about our name—Inversgail? The story begins with the small river that flows from green sheep- and heather-covered hills and spills into the sea at Inversgail. There’s no question about the “inver” part of our name. Inver means both “river mouth” and “confluence of waters.” The river’s name, though, is the source of some debate. On modern maps it’s the Sgail. But once upon a time, and since maps of the area have existed, the name has been spelled Sgail, Skail, and Sgeul. Which is correct? "Some folk say that Sgail is an Anglicization of sgeul, a Gaelic word for story. Legend has it that a family of noted storytellers and bards lived in the area and the “Sgeul” folk believe the river was named to honor them. And because stories, storytelling, and mouths all go together, they find the name Inversgail particularly apt. Other folk say Sgail is a misspelling of skail, a Scots word meaning to spill. Rivers naturally spill their waters at their mouths, and thus the name Inversgail. A third group believes that inver—meaning both mouth and confluence—holds the key. The name Inversgail, they say, results from a confluence of meanings. The storytellers lived and told their stories beside the river, and the stories spilled from their mouths, just as the river spills into the sea at Inversgail. Which origin story should you believe? We leave that to you, our visitors, to decide. "Inversgail is a west Highland gem. We’re a resort town within easy distance of Oban, Fort William, and Dornie, located in the Argyll and Bute council area. Our natural harbor and white sand beaches are protected from the open sea by the western isles. Our summer waters are warmed by the Gulf Stream, inviting bathers and boaters. Hills rise behind our charming houses and shops creating a picturesque backdrop and fulfilling the dreams of photographers and hillwalkers. Fishing and crofting are the traditional ways of life in and around Inversgail. Tourism and our tradition of good stories allow our lovely area to thrive. 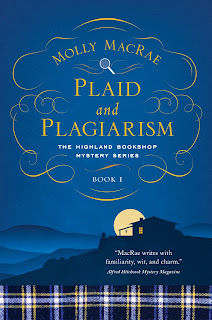 "A friendly word of caution—once you’ve visited Inversgail, you’ll want to call it home. And we’ll be here to welcome you!" 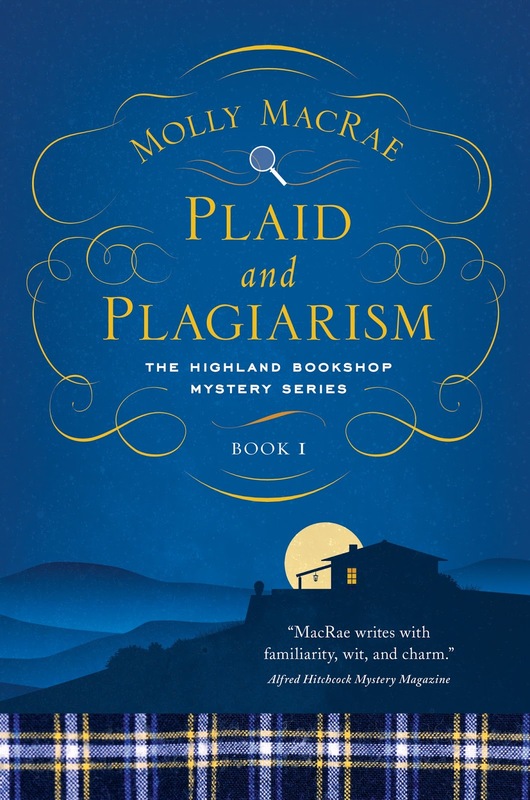 Plaid and Plagiarism, book 1 in the Highland Bookshop Mysteries, comes out December 6, 2016, and is available for pre-order now. Ah, lovely. I visited the Highlands once, a very long time ago, to see the Highland Games in Oban (grown men throwing telephone poles?). It was delightful, so I'll look forward to the book. BTW, the Irish word for story is "sceal" (with an accent over the e). Isn't there always a story? And stories make the world go around. Thanks for stopping by, Sheila! Come visit anytime, Terrie! We're planning a B&B above the bookshop - we're calling it a B&B&B for books and bed and breakfast - and you can stay there in a room overlooking the harbor. I'll keep the light on for you, Elaine! You and I can have tea in Cakes & Tales, the tea room we're opening next to the bookshop, and then I'll show you all around the town and the area. Fun!